Picture the perfect Christmas scene. Snow is falling on picturesque mountains surrounding tiny towns and cozy cabins. Smoke is slowly rising from the chimneys as families sit by the fire and enjoy hot cocoa after a long day of skiing, hiking, and snowmobiling through the beautiful hills and woods. This is a snapshot of what the perfect Christmas in Utah looks like. Grab your family and venture down to Southern Utah for a winter wonderland where you can attend fun holiday festivals, ski and snowboard the amazing mountains, and even attend a New Year’s Eve party at one of the most unbelievable national parks in the country. Ready to start planning your trip now? 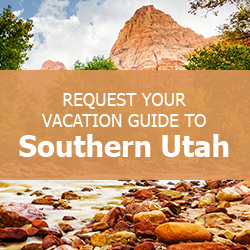 Request access to our free Vacation Guide for all of the best things to do and places to see during your visit to Southern Utah! Unwrap Your Vacation Guide Today! Ring in the Christmas season at the Dickens Festival in St. George! This holiday celebration highlights the works of famous English author Charles Dickens and features a winter village full of shops, treats, and plenty of entertainment. This festival will surely get you in the Christmas spirit! Head over to Duck Creek Village for the exciting Christmas on the Mountain annual community event. Bring your kids to True Value for a visit with Santa and then make your way to the Dance Hall for the candlelight parade. After the parade, stay for the grand lighting of the Christmas tree in the center of town! Hot cocoa and snacks are available to keep you warm and toasty in the cold Southern Utah winter! Adrenaline junkies will relish in the fantastic skiing, snowboarding, and snowmobiling in Brian Head! Rent a snowmobile from Thunder Mountain Motorsports and cruise around Dixie National Forest and Cedar Breaks National Monument on the fluffy white snow. Brian Head Resort is the top spot for snowboarding and skiing in Southern Utah. Beginners and experts can buy a half-day or full-day pass and take on the slopes that best fit their experience level for a day of family fun! Start the new year right at the Bryce Canyon New Year’s Eve Party! Held at Ebenezer’s Barn and Grill, this is a great place for families to enjoy a special evening together at the end of a great Christmas vacation to Utah. A live DJ, dinner, and other fun activities highlight this celebration of the new year. If you want to explore Bryce Canyon National Park, visit the National Park Service website for details about safety warnings, closures, and things to do. For more details on the perfect Christmas in Utah, check out our Brian Head holiday guide! Spend Your Christmas in Southern Utah! A Utah Christmas is one that you’ll remember forever, especially in your Family Time Vacation Rentals home. Our long list of premium accommodations feature the best amenities and excellent locations so you can explore all of the fun activities, events, and places to see in Southern Utah! Check our availability to start planning your trip today! Don’t forget to download our free Vacation Guide for more ways to enjoy your Christmas in Utah!